◇Reliable Connection - Powerful 2.4G wireless technology supports up to 33-feet smooth connection. ◇Long Battery Life - Equipped with 1500 mAh rechargeable batteries. A full charging takes less than 5 hours and provides daily use for up to 90 days. ◇Ultra Slim - Compact and thin design is fashion and portable. Perfect for office use. ◇Quiet as Whisper - Low profile keys provide quite typing and clicking experience. ❤️If your MacBook is type-c, you should use a USB hub to change the USB-C into USB. ❤️If the keyboard or the mouse is unresponsive, please check the on/off button or charge them. ❤️The mouse works better on dark color mousepad. If you use the mouse on white table or white mousepad, the cursor may not move well. LONG RANGE & STABLE WIRELESS CONNECTION - New 2.4GHz wireless technology makes sure reliable connection and works for further distances (up to 33ft/10m). The keyboard and mouse share the same USB dongle which can save your USB ports. Easy to use - just plug and play. PORTABLE, SLIM & THIN DESIGN - Full size keyboard with 14.2'' length and 0.3'' thickness -very portable. The compact design is stylish with metal element on the side. RECHARGEABLE & LONG BATTERY LIFE - Built-in rechargeable 1500mAh batteries in the keyboard and mouse. You do not need to purchase other batteries separately. Up to 90-day use with a full charging. Auto power-off function make the keyboard and mouse save energy. WHISPER-QUIET KEYBOARD & NO MORE CLICK NOISE MOUSE - Low-profile keys make you enjoy a comfortable typing experience with just a little typing sound. The silent mouse is quiet nearly without click sound, but the lack of click doesn't make it feel disconnected from the experience. You finger can still feel the clicks. So, you can never worry click sound bothering others when you are working in office. 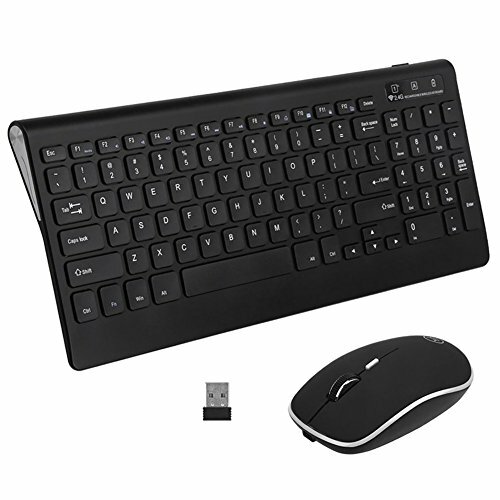 GOOD QUALITY & SATISFYING WARRANTY - The rechargeable wireless mouse keyboard bundle is FCC and CE certified, compatible with Windows/Android/iOS system, and works great for desktop computer, laptop, PC, notebook, MacBook and other devices. Comes with 30 days no-questions-asked return policy, 1-year manufacturer's warranty and our lifetime friendly customer service. If you have any questions about this product by Soundance, contact us by completing and submitting the form below. If you are looking for a specif part number, please include it with your message.